Garco was pieced together from used aircraft parts in 1953 by Harvey Chapman in his California garage. He was controlled with a five-jointed mechanical arm which fit over Chapman's own, controlling Garco's right arm and fingers with perfect synchronicity. 22 pushbuttons located along this unit controlled the mouth, eyes, hips, and the other arm. Little vacuums in the fingertips allowed him to pick up small objects. The intention was for robots like Garco to perform jobs humans shouldn't: mix explosives, handle bacteria, weld underwater. Instead, he immediately became a Z-list celebrity. 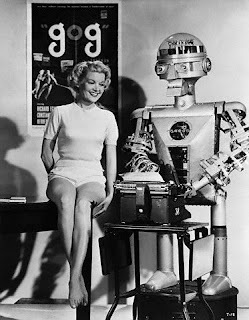 Here he's seen promoting "Gog" (a forgotten 3D killer robot movie - I saw the last existing print at the Graumann's Egyptian last year), and he showed up in a handful of other promotional photos. The only footage I can find is when he introduces Walt Disney on the excellent "Tomorrowland" DVD set. Current wherabouts unknown. "The intention was for VIN DIESEL to perform jobs humans shouldn't: mix explosives, handle bacteria, weld underwater. Instead, he immediately became a Z-list celebrity." the sad truth is, hiring illegal immigrants is a hell of a lot cheaper than building and maintaining robots.